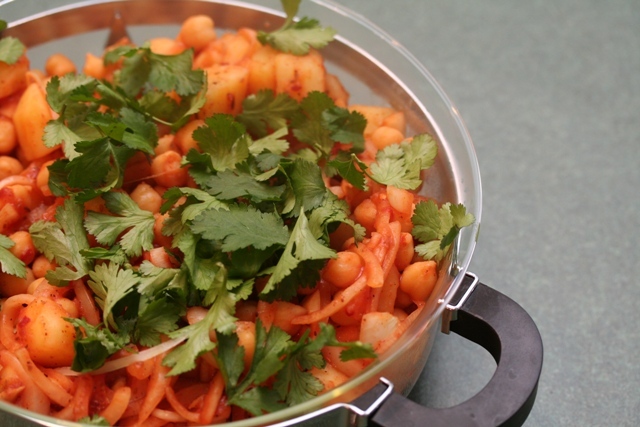 Alu Kabli is one of my very favorite quick Indian dishes. It’s street food – something mothers in Kolkata might prefer their sons not eat on the way home from school. But I don’t think that ever stopped K.M. Like me, K.M. learned to cook more from books than from his family. But when we make Indian food – Bengali food in particular, he has the great advantage of knowing what it should taste like. And that gives him final right of approval over any recipe we try out. And 10 years after we first made these potatoes, we both still love them. Our recipe for this tangy potato dish has evolved from one I originally found in Bharti Kirchner ‘s book, The Healthy Cuisine of India. (It’s a fabulous book, actually a collection of Bengali recipes. Kirchner, who lives in Seattle and is also a novelist, has a talent for writing clear, simple recipes.) Over the years we’ve made the spices a little bit bolder and increased the amount of chickpeas in our formula. It’s a testament to the taste of Alu Kabli that I will gladly peel potatoes or stem cilantro for this dish – two tasks that I can hardly ever be bothered to do for other recipes. Many of the alu Kabli recipes I’ve seen online lack the most important ingredient; black salt or kala namak. I wouldn’t make alu Kabli without it. Too much can be overpowering – at least to me – I’ve tried Masala Coke in Kolkata, and I just can’t go there, but handled carefully, it is a refreshing flavor and at the same time, adds an earthy element. It has a subtle sulfur flavor; I mean that in a good way. Kala Namak is an unrefined mineral salt -very different from Hawaiian black salt – and there really isn’t a substitute. But it’s pretty easy to find. World Spice Merchant in Seattle is my favorite source, but many Indian grocery stores carry this fine pink powder. (Why pink? Apparently the salt crystals are black when whole and pink when ground. ) 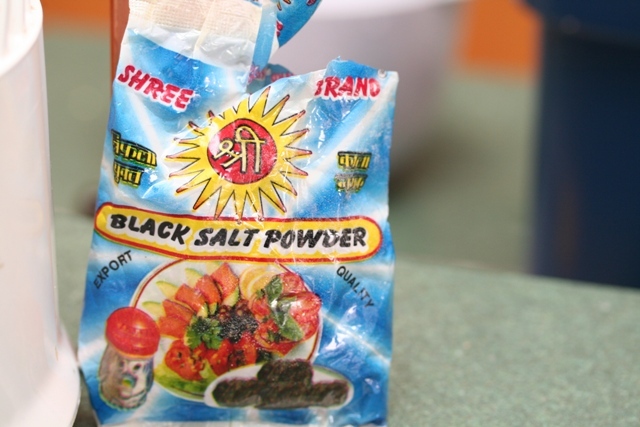 According to Ayurvedic medicine black salt is cooling and good for digestion. Which is good thing, because whenever we make alu Kabli, I always eat too much. 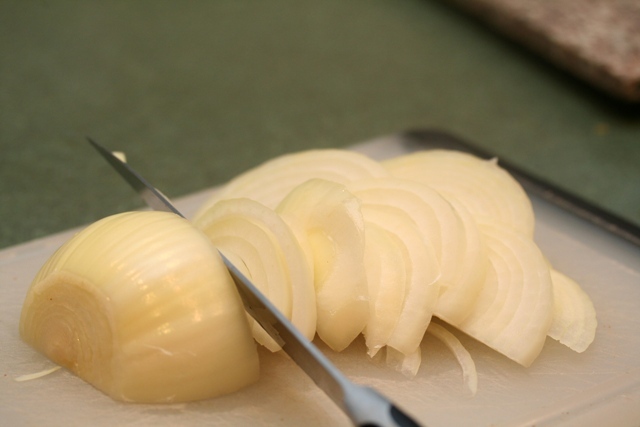 I’ve served it as a side dish, as a main dish and as an appetizer and it is always a hit. When I made it earlier this week, I used Mayer Lemons – mainly because these lemons are local, but I still think limes provide the most authentic tang. 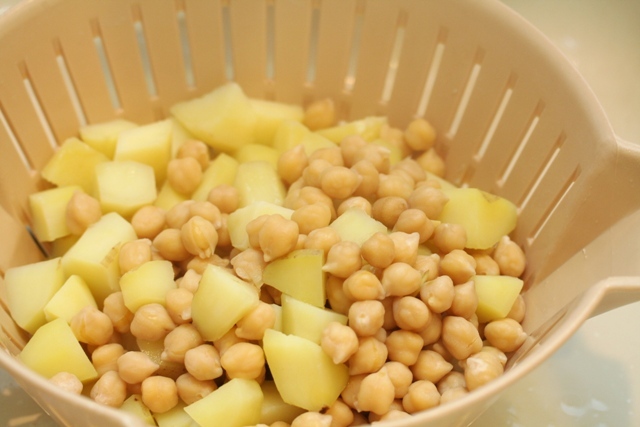 Potatoes and chick peas – who knew how great they’d be together? Everyone in Kabul, apparently.